Blue Buffalo Home 4 the Holidays 2018 was a huge success! Not only did the campaign find families for 1,358,443 orphan pets, we selected three amazing rescued pet story winners through the #IChoseToRescue Challenge. We received 1,527 entries for the challenge, and we couldn’t be more grateful for all the rescue pet parents who submitted their rescue pet photos and stories. Thank you all for advocating for pet adoption and orphan pets. Special thanks to Blue Buffalo for providing our pet parents with a year’s supply of food and a generous donation of $500 to each organization each pet was adopted from! Lucy is a blessing! It’s just my 5 year old daughter and I and I thought it was time to expand our tiny family. I also knew adopting was the best way to go about it. I felt like the seed was planted in my heart to adopt at Five Acres Animal Shelter. Lucy, also known as ‘Nibbler’, had a ton of energy and excitement. The shelter was concerned she may be a handful. The moment ‘Nibbler’ entered the room she came up to me on her hind legs with her arms wrapped around my leg as if she were hugging me and looked up at me as if she were smiling at me. Her eyes were telling me, “It’s me! I’m the one you’ve been praying about! Let’s go!” Talk about confirmation! 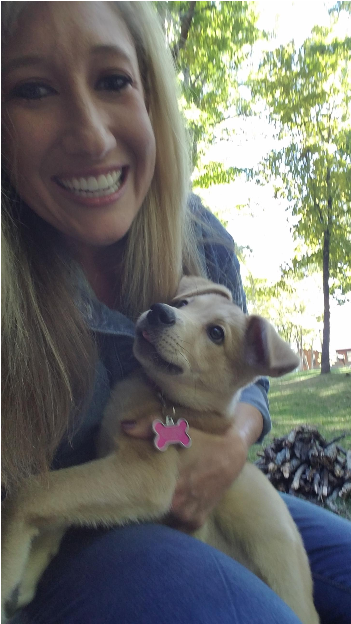 When my daughter, Sofia, met Lucy, she said to me after she saw Lucy’s stitches, ‘This dog is perfect for me, but she’s broken.’ After minutes of playing Sofia was tickled and said, “This dog is perfect for me!” Sofia named Lucy. Lucy has our middle name and Sofia’s hyphened last name – which was a big deal to Sofia. Lucy has overwhelmed us with her energy, excitement, joy and love. She hugs us and random strangers in the neighborhood on our long walks, which then strikes up conversations. These strangers are now my acquaintances and their dogs are Lucy’s friends. When Sofia is away visiting her dad, Lucy keeps me company. We go out and play, snuggle, and Lucy even has her own room. God knew we needed Lucy in our lives and you can tell Lucy needed us in hers. We are glad Five Acres Animal Shelter was there to walk us through the seamless process and provided us all the info and start up food, shampoo, everything we needed to start things off with a bang! After losing my first rescue, Bailey, in 2014, it took me two years to rescue my second. That second was Zola. Zola had been in the shelter for a year and because of cancer, I only had her 20 months. 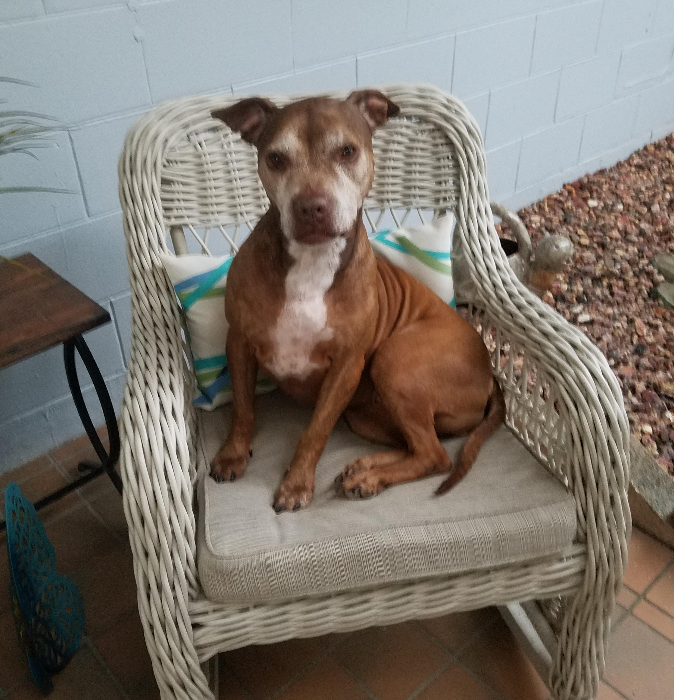 Because of the level of care I saw given, there was no question, when I was ready to adopt again, that I would turn to Seminole County Animal Services. When I called Diane at the shelter and asked who needed adopting most, the first name out of her mouth was Marcy. Despite having been in the shelter for 2 years, Marcy came to me healthy and happy. They truly care for the animals there! She is beautifully behaved, very cuddly, and despite being almost 9 years old, behaves like a puppy! She never lets me out of her sight. Wherever I am in the house, she is sitting in a chair nearby watching me. This photo is outside my laundry room. She doesn’t like lying on hard surfaces, so when I’m in the laundry room, she jumps on the rocking chair and waits for me. Christmas has been a rough time for many years. My father died right before Christmas in 1990. Bailey died the day after Christmas in 2014. Zola came to me right before Christmas in 2016 and brought meaning back to the holiday. Adopting Marcy in November brought new meaning to Thanksgiving, and she will bring a whole new level of joy into my home this Christmas! My daughter has anxiety issues. Sparrow (right) was adopted for her. She can sleep at night because Sparrow snuggles with her all night, and during the day she allows her greater independence and a calming reassurance. Solo (left) is the perfect older brother. He is always teaching and guiding Sparrow and playing with her. Also, he provides a bathing lesson when necessary. I am so amazed how well they have bonded only being together for about two weeks. They were both found outdoors and needed nursing through some health issues. Since then, they have grown, gained weight, and their coats have become shiny. It is such a gift to have them in our lives. They provide love and sunshine and laughter every day to all of us. We have seen them relax and start to understand that they are safe and now have a forever home. They are truly holiday miracles! The next #IChoseToRescue Challenge will begin October 1, 2019, at the start of Blue Buffalo Home 4 the Holidays. We can’t wait to see the pets and stories!